Commercial real estate investors always scrutinize properties before buying them. However, sellers often fail to appreciate just how much of an edge they can gain by conducting due diligence on their own assets prior to putting them on the market. While sell-side due diligence is still relatively rare, running due diligence on your own property will likely reduce its time on the market, lower the risk of re-trades, and even improve the overall return. That’s because landlords often are a bit myopic about how prospective buyers will perceive their properties. All assets in commercial real estate tend to have individual quirks—challenges, workarounds and loose ends that over time owners grow accustomed to and consider insignificant. But potential buyers see things differently. To them, these quirks are unknown or unpredictable, and pose material risks. Even though sellers tend to be familiar with the idiosyncrasies of the assets they own, they can also be inadequately informed about certain problems as seen through a buyer’s eyes. For example, landlords are frequently unaware of risky “outs” in specific tenant leases. Maybe these clauses never came to the landlord’s attention upon acquisition of the property, or the agreement was signed so long ago that the language has simply been forgotten. In other cases, information relevant to the pro forma, like an updated physical condition report, or their CAM or other expense reconciliations, may be lacking or woefully out of date. Sell-side real estate due diligence brings such issues into focus. Running a lease-comparison analysis, for example, often reveals troublesome co-tenancy clauses. With a complete picture beforehand of any language that could give tenants the right to terminate leases or lower their rents, sellers gain options. They can renegotiate those clauses; reduce surprises by handing the buyer a thorough, upfront report about tenant dynamics at the asset; or simply wait to take the deal to market until issues are addressed. To be sure, conducting sell-side real estate due diligence is not necessarily comfortable or easy. It can involve addressing hard truths, but making the effort upfront is far better than scaring away a qualified buyer with a raft of surprises. When buyers bail midstream, the remaining bidders often move on to other deals. No seller wants to go back and beg second- or third-place bidders to take another look at a deal. Laying out the good, the bad and the ugly for a prospective buyer bolsters confidence in the value of the asset, as well as in the seller’s motivation and transparency. These days, marketing a property is about more than shiny brochures or impressive drone-flight videos. Today’s buyers want more and better data. Toward that end, specialist firms routinely perform underwriting for the gamut of projects, and have broad expertise in creating best-in-class presentations. They leverage those same skills and software tools in performing seller-side due diligence. The result is a package that can impress buyers and brokers alike by answering pressing questions from the outset. This might include clearly and concisely demonstrating that rents collected actually match amounts stated in leases, or that tenants’ share of expenses have been verified. By scrubbing general ledgers, income statements, utility bills, bank statements and more, the team can identify prevailing issues. When prospective buyers have this information at their fingertips—often in an “FAQ” format—it expedites the due diligence process. Offers come in faster with fewer contingencies. Pricing is more resilient to interest and cap-rate fluctuations. Re-trades are averted. Getting buyers to the closing table is what really matters. When the seller sends an entire package with key documents up to date and in one place—as opposed to just emailing financials and bank statements as they are requested—this signals sincerity and contributes to a sense of urgency . This is especially important in a competitive transaction market characterized by picky buyers and widening bid-ask spreads. Having these packages prepared in advance also improves the broker-selection process. Top brokers are selective about clients; they want a high probability of closing the deal and seek to work with serious, motivated sellers. Providing brokers with a professional package on the property demonstrates a high level of commitment to the transaction. 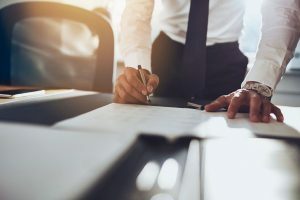 After working with our firm on sell-side real estate due diligence, one landlord recently extolled the benefits of being able to hand so much rich information to brokers and potential buyers. receiving over one hundred confidentiality agreements from potential bidders on the deal they took to market. A record number for them, even in this market. Solid numbers backing up the asset also makes it easier for sellers to spot unscrupulous brokers using questionable calculations to justify high fees and make unrealistic promises to win listings. Due diligence can give sellers of all sizes an edge. Even institutional owners often have room to improve the resolution of their reporting in this area. Properly executed, the process empowers sellers to minimize surprises, prepare fast and complete answers and keep buyers engaged—all the way to the closing table.